With a new album dropping on March 10th, the time is ripe for a quick review of just how amazing Enslaved is. Haugesund, Norway’s finest have been plying their trade since 1991, and have been described as many, many different types of metal over the years. If you had to sum it up—and please do not do so by labeling them “viking metal”—they’re probably best described as “progressive-extreme-blackened-death-metal.” Or something like that. On “Ormgard,” you’ll find many classic metal elements: a driving pace, pick dives galore, crunching power chords and a severe lack of clean vocals. Despite that, this album is not immature. It’s quite the opposite: a real masterpiece that was way ahead of its time. With it’s tinny production, blistering cymbals and gut-wrenching vocals, this thing’s definitely worth a listen. Below the Lights is by far the band’s proggiest album. Not that the band wasn’t experimental before, but this album really marked their first full, headlong dive into the arts of progressive metal. The album’s third track, “The Crossing,” is possibly the clearest example of how far they took the idea. The song combines a range of exceptionally different elements, and at one point simply fades from one part into a completely different, separately-recorded one. The contrasting acoustic guitars are lowered as a much heavier half comes gliding up from the depths with vocals. It’s a stellar experiment that works out very well. If you get the wonderful opportunity to see Enslaved live, you’ll probably end up hearing this song toward the end of their set. With a new lineup (including skilled then-new drummer Cato Bekkevold) in tow, Enslaved experimented with pace changes that were previously unavailable, or just unheard of, to them. “Isa” opens with fury and powers through the chorus with Grutle Kjellson menacingly grimacing the song’s title while Ivar Bjørnson sings melodies over the top of the chorus. This song is a must recognize for any Enslaved fan. Released in 2006, Ruun was a very logical extension of Isa. The band took key steps forward in both production and songwriting, seamlessly blending their extreme and progressive writing styles. Much like “Isa,” “Path to Vanir” is another marching song, but rather than blending the different vocal styles, we see Enslaved attempting to seamlessly combine multiple contrasting portions of the song, which they ultimately do with ease and brilliance. It’s a very powerful song that will keep your fist pumping throughout—whether to Kjellson’s tortured screams or Bjørnson’s simple and direct melodies. Ruun‘s title track starts off with an ominous, slithering guitar line that contrasts perfectly with a separate, muted rhythm line. The song reminds me of a retelling of a horrifying nightmare—and at one point, the lyrics even channel that kind of vibe. (“Visions from an altered state/they conceal and revelate”) Progressive bands don’t often make my skin crawl but this song does so with ease. Enslaved went independent in 2008, and although the album was later picked up by Nuclear Blast, the band had near-total creative control over Vertebrae. On the album’s third track, “Ground,” the slower, elevator-like pace of their metal blended perfectly with Arve Isdal’s melodic and masterful solos. (And make no mistake, this track certainly let him unleash a long one.) While the track takes on an almost stoner feel down the stretch, it is still unmistakably Enslaved, and undeniably awesome. Vertebrae‘s sixth track sees the band take on a completely different, almost classic rock-like rhythmic feel. Extra fuzzy guitars give help give the opening a throwback feel before Kjellson unleashes his diaphragmatic assault. With a run-time of nearly eight-minutes, you’d think the track would go through the typical rhythm and feeling changes that most Enslaved songs tend to, but it doesn’t; it drones on mesmerizingly. Despite its relative non-traditionalism, “Reflection” is commonly picked as a top track off this album. A terrific listen, but perhaps more for experienced listeners. 2010’s Axioma Ethica Odini saw Enslaved still more cohesively blend progressive elements into their songwriting. The album’s production is top notch, with richer, thicker, more reverb-driven vocal work than we’d ever seen from the band. The third track, “Waruun,” is a great example of all this. The song opens ominously with croaked vocals, crunching guitars and a very dissonant, dark feel, but as the darkness builds, the song leapfrogs itself until all that is left is starkness, a few whispers, and some clean, yet dissonant guitars. It’s then that you can see the beauty of what great production can do for a band like this, with two distinctly talented vocalists. Like most Enslaved songs, it’s hardly “short,” but all the same: it’s 6:42 minutes worth absorbing. After opening with an absolute whirlwind—with poisonous, rattlesnake-like vocal work and blast beats abound—“Roots of the Mountain” quickly drops its ferocity and highlights the beauty of Ivar Bjørnson’s vocals. A symphonic keyboard clearly drives the classically inspired focal point of this song, but don’t fear: we quickly spiral into typical, yet more balanced Enslaved fury again. If I were to ask my buddies which Enslaved song they like the best, this thing would be on most of their shortlists. “Death in the Eyes of Dawn” showcases the band’s ability to blend styles seamlessly. Both vocalists are featured prominently again, as the song drives from a headbanging verse into a melodic, almost triumphant chorus. In my opinion, RIITIIR is Enslaved’s finest album to date, and this song is a shining example of why. That’ll do it for now. Listen to Enslaved, and in doing so, improve your life exponentially. Previous Article Quickies: News from Symphony X and The Black Dahlia Murder. 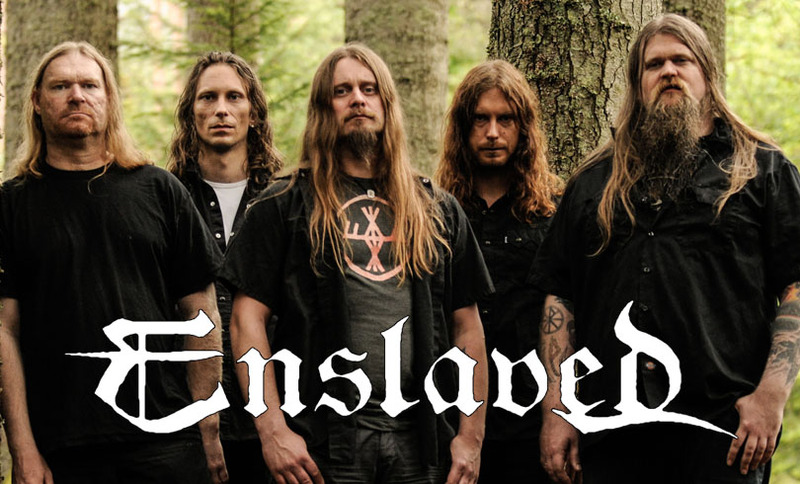 And a new Enslaved Song… !! !